Laser City is finalizing a new contract with United Plumbing for a pipe installation at City Hall. 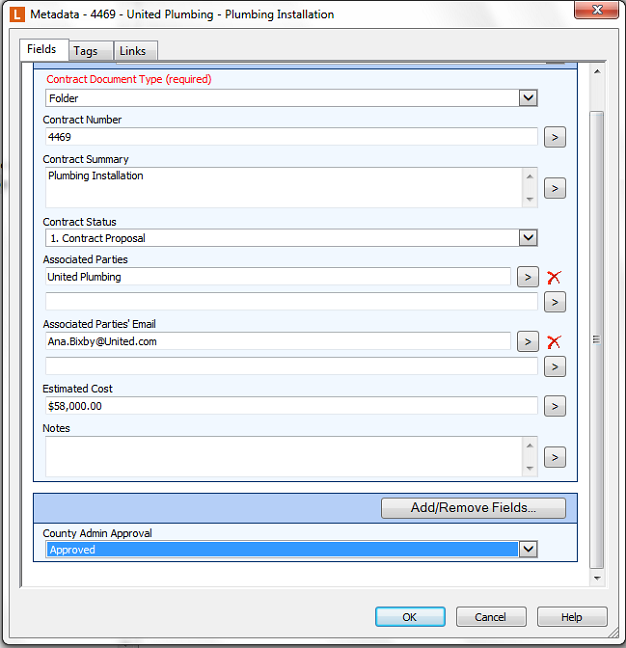 Here is how contracts can be processed from creation to archival with Laserfiche. Once the initial contract is drafted in a word processing program, it is submitted along with supplemental documents through Laserfiche Forms. 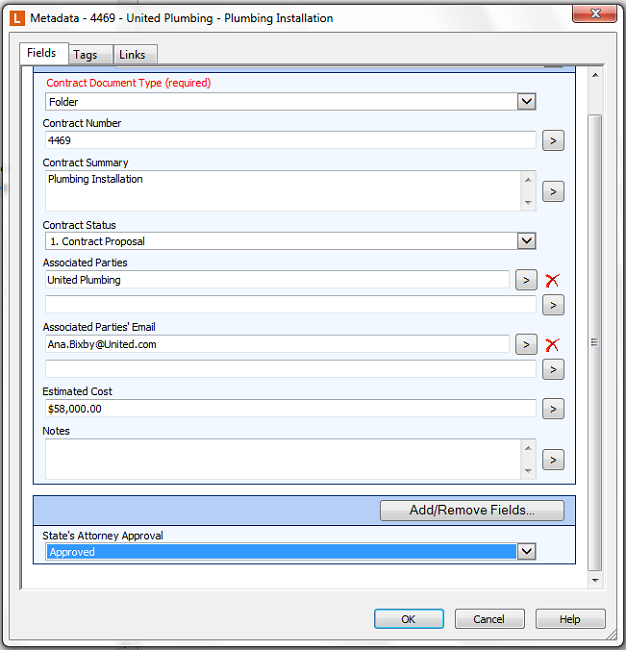 Laserfiche Forms creates a new United Plumbing folder in the main Contract Proposals folder in Laserfiche. 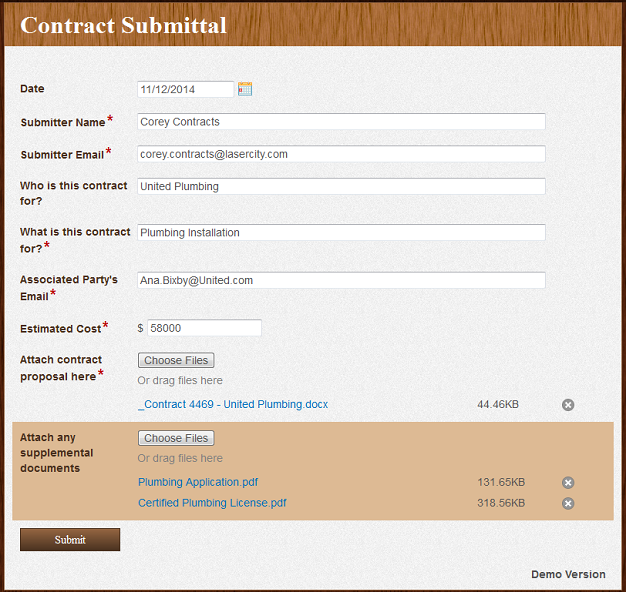 From there, the contract clerk gets an email with a link to the United Plumbing contract folder. She opens the contract and ensures the packet is complete. If information is missing, she notifies the submitter and scans any additional information directly into the folder. 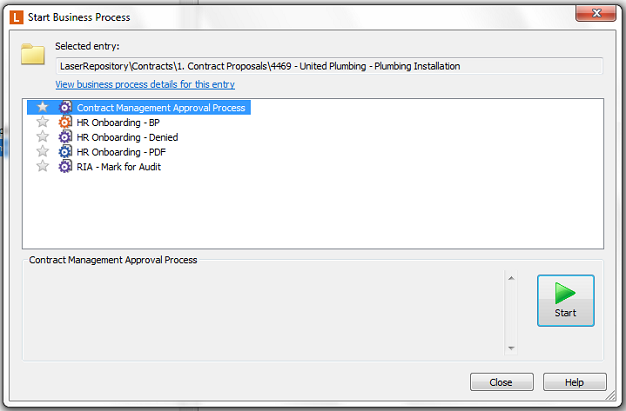 Once the contract packet is complete, she starts the Contract Approval Business Process. Laserfiche Workflow automatically moves the contract packet to the Approval in Progress folder and sends an email to the state attorney. The state attorney can make any changes necessary and save the contract as a new version. He then selects “Approved” from the State Attorney Approval field. 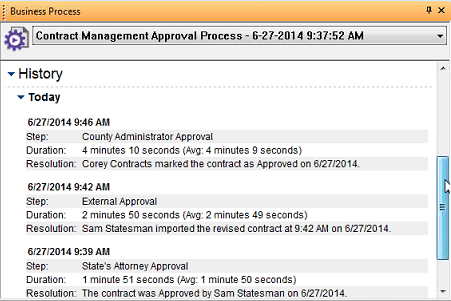 Laserfiche Workflow sends an email to the county administrator with a shortcut to the contract folder. He opens the contract and can approve or deny it by changing the value of the County Admin Approval field. 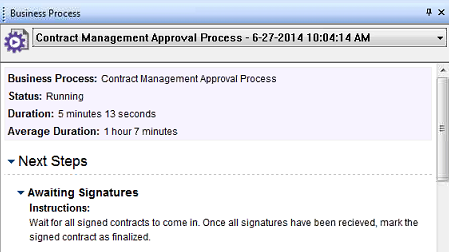 If the contract is approved, it is moved to the Awaiting Signatures folder. An email is automatically sent to United Plumbing requesting signatures. The contracts assistant can look in the business process pane in the contract’s folder for instructions on what to do next. 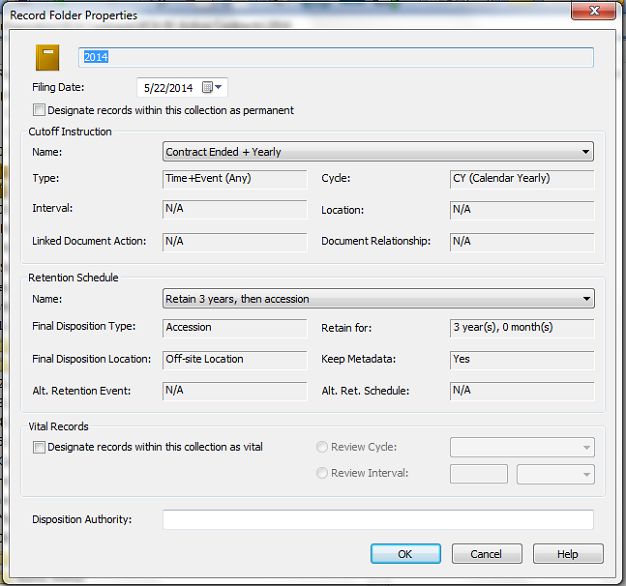 This action moves the contract to the “Finalized Contracts” records folder for storage. Shortcuts are also created in the Finalized Contracts folder and in the Contracts by Parties folder. 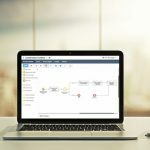 At any time during the contracts management process, any of the internal stakeholders can look at the business process history of the contract folder to learn where the contract is in the process and who has performed actions on it so far. 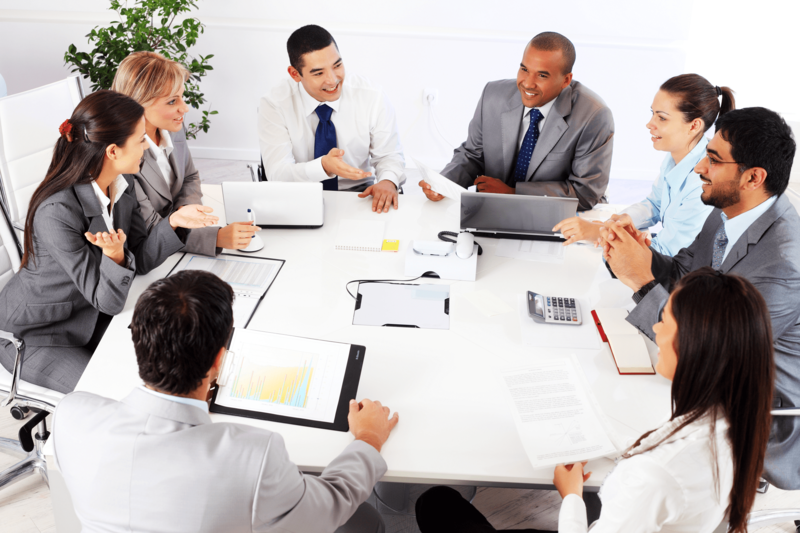 Contract review and approval goes more smoothly because everyone is notified of their role in the process. Since there is only one centralized copy of the contract, all changes are incorporated into the same document. Version control makes all of the changes to the document visible in the metadata pane. All contracts are secure due to version tracking and role-based access. It is possible to revert to an older version at any time, if unauthorized changes have been made. Accountability is improved since it is possible to see exactly who reviewed, altered or approved the contract over its lifetime. Records management is simplified with automatic retention schedules applied to finalized contracts.